This page in a nutshell: Listed below are various tools and tutorials intended to simplify, make more efficient, or provide additional functionality to Wikipedians. "WP:TOOLS" redirects here. For the former Toolserver, see Wikipedia:Toolserver. See also Category:Wikipedia tools and Task-oriented tool list. For the Toolserver, see Wikipedia:Toolserver. For selection of tools, see the Directory NG. To look for a tool, use the Hay's tools searching page. Good tooling. Editing tools, tools intended to provide enhanced editing functionality. Contains edit page tools, edit bots, spellcheckers, wikisyntax conversion utilities, etc. MW, "VCS-like nonsense for MediaWiki websites" with status, pull, diff, commit, and merge. WatchlistBot is a bot that delivers realtime alerts via instant message (XMPP) when watched articles are edited or when watched users or IP networks edit. Navigation shortcuts offer the ability to add personal links to the sidebar, providing quick and easy access to favourite articles within Wikipedia. Axon, a Firefox search add-on. Double-click a word or select text to open the Wordnik dictionary definition or a Wikipedia article in any language of your choosing. Cleeki, Cleeki is a Windows-based program for generic search purpose, but particularly optimized for Wikipedia. It allows one click keyword grabs from anywhere on the screen and returns Wikipedia results for them. GlobalWPSearch, search across projects and show missing interlanguage links. whichsub finds transcluded templates of a given page which contain a given string. Find Link Tool Find links on Wikipedia tool created by Edward Betts. Note: Google search results can be several days or even weeks out of date. Mirrors of Wikimedia content can be filtered from Google search result pages in Firefox using the CustomizeGoogle extension. See meta:Mirror filter for instructions and a filter list. Wikipediavision (designed by László Kozma) visualizes recent anonymous edits using Google Maps. XTools Page History Page statistics and visualization, provides sortable and exportable list of all contributors with number of edits and amount of added text. Provides also results of syntax and grammar checks and latest assessment history. userhist, user script, adds interface elements for isolating a user's changes to a page. Contribution Surveyor – surveys a users contributions and orders edited articles by the total text contributed. XTools Edit Counter A powerful and full-featured editor analysis tool. Editor Interaction Analyzer compares the edits of two to three specified editors to see which articles overlap, sorted by minimum time between edits by both users. Only works on the English Wikipedia. Speed: slow. Intersect Contribs, compares the edits of two to eight editors at any WMF wiki to see which articles overlap. Speed: fast. Intertwined contributions, merges the contributions of two editors at any WMF wiki into a single list. Speed: fast. Interaction Timeline a chronological history of two users' across pages where they both made edits. Wiki Replay, see m:Grants:IEG/Replay Edits and wm2014:Submissions/Replay Edits for more details. MediaWiki Table Utility or this updated version This class constructs a MediaWiki-format table from an Excel/GoogleDoc copy&paste. It provides a variety of methods to modify the style. It defaults to a Wikipedia styling with first column header. Microsoft Office Word Add‑in For MediaWiki. For Microsoft Word 2007 or higher. For other Macro, see mw:Word macros, Visual Basic macros to use within Microsoft Word to prepare content to be pasted into a Wikipedia page. Mediawiki CSV Import tool: A proprietary, commercial, tool to create mass Mediawiki pages using CSV datasource and variable based templates. Results merged into a valid Mediawiki XML Import file. wiki2csv: a commmand line tool that can convert wikitables to CSV and back. Useful to edit wikitables in Excel (or OpenOffice). LibreOffice Writer is free. It can open almost any file format. It can export to Mediawiki: File menu > export > save as type > MediaWiki. It will save the file as a .txt file which can be opened with any text editor. Copy the wiki code from the text file. You can save any web page as an HTML file, and then open it in LibreOffice Writer. Edit as needed. Remove the parts you don't want. Keep only tables for example. Then export to MediaWiki. Tables can be further edited in LibreOffice Calc. See: Commons:Convert tables and charts to wiki code or image files. And: Help:Table and the section on spreadsheets and the Visual Editor. Appropedia:Help:Porting PDF files to MediaWiki, the most effective method found so far requires Adobe Acrobat (paid version). CSVLoader is an AutoWikiBrowser plug-in that allows creating and updating articles using CSV data files. wikitable2csv is a web tool that extracts wikitables from a given page and converts them to CSV. wiki2csv is a command line tool that can convert wikitables into comma separated value files that can be edited by Excel or LibreOffice. The result can be converted back retaining most of the original formatting. MediaWiki to LaTeX Convert from Wiki to PDF, EPub, Odt and LaTeX formats. Not English, tools that have not yet been translated completely into English. Some need their descriptions translated from German, others are not available in English. Help translate if you can! Note: Checkinks is buggy use with caution. Consider using instead Internet Archive Bot which can be found in the History tab of any page: "Fix dead links" – login does not require a password. PetScan (manual), searches categories recursively. will find subcategories that overlap with other categories, templates, etc. MTC!, A tool that makes it easy to transfer files to Commons en masse. 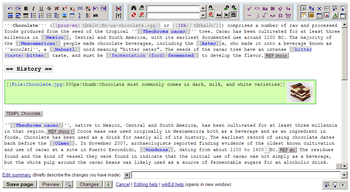 Wiki Editor Plugin for Notepad++ 32-bit (x86) – a free source code editor.